Arashi ni Shiyagare's Directors in Charge Speak Out! We've sought out the directors in charge of their outdoor shoots because they're always able to observe the members at a close distance! This time around, we heard some insider stories about Aiba-chan and Nino during their shoots! It started off as a segment where Ninomiya-san used his own unique perspective to tackle current event topics or current societal trends. In coming up with solutions to these current event topics, we turn it into an ambition of sorts to do it whether it's for the world, for other people, or for ourselves; our concept was to have him get personally involved in tackling such problems. It would be nice if Ninomiya-san himself had any ambitions that he particularly wanted to fulfill, but he doesn't have any at the moment (laugh). Ninomiya-san has a completely different perspective from the average person, which allows us to cook up anything we want, I think. That is, we can probably come up with something new even with common current affair gags thanks to Ninomiya-san. He's a jack-of-all-trades who can do anything, which is possibly what led to this segment being so broad and vague. Whenever we decide on an ambition, we focus first on researching what sort of current topics we can use and then brainstorm together on interesting things we can cook up with it. Keeping it from being too cliche is something we try to keep in mind. We have "Doing something that's never been done" as our theme, and the first thing we invented with that was the concert outfit using firefly squids. It was likely a huge step forward for us to turn firefly squids into an outfit that can be worn instead of seasonal food meant for eating, I believe. 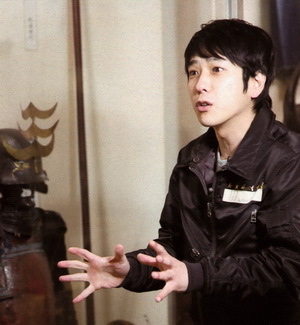 I think the location shoot where Ninomiya-san best showcased his potential and character was the one where he had to hold negotiations to wear that helmet headpiece. That location shoot only took about an hour or so, yet he was able to organize everything on his own and negotiate his way into getting what he wanted; I thought it was incredible how far he managed to go. Ninomiya-san has very good instincts, and he's the type who doesn't need cue cards where people usually would need them. Even if we don't put up cue cards and only verbalize what we want, he responds to our needs without fail. There's never a time where he couldn't fulfill our requests; he pushes or pulls back for us based on the general mood in the room or through eye contact. We hardly hold any meetings either. The only thing we do is explain the general plan, but the negotiations for wearing that helmet or cutting a watermelon with a katana sword-- the conclusions for those were completely up in the air. We were working on the basis that we can just go to some other place if our plan fails, but man, is Ninomiya-san good. Seriously (laugh). No matter who the other party is, he makes them conform entirely to his own pace and gains their trust. Even with the foil roasting of that giant mushroom, we were told at first that it was okay to eat it if we only took a little bit. But once Ninomiya-san arrived at the scene and talked to the people who were in charge of looking after the mushroom, they said we could take it all and we ended up with the entire thing. The way Ninomiya-san has with words is a truly amazing aspect of his, isn't it? He's very affable; he has a unique air about him that makes people talk with him in a very unreserved way 2 seconds after meeting him. He's not at all timid, and he never wavers regardless of who the other person may be. Ninomiya-san is also good at setting the other party at ease, and I've never seen him display any sort of nervousness during his negotiating stints. The only time I saw him look nervous was prior to his window cleaning appearance at the Abeno Harukas building. For one brief instant, I felt like I saw a Ninomiya Kazunari that was different from the Ninomiya Kazunari we know. That was the first time I ever saw him with that sort of expression. What makes this segment fun is the fact that you can never tell how things will end up. Even with things where you can't guess how they will turn out, you know Ninomiya-san will be able to do something about it; he has that power to pull it off, I guess you can say. He really is talented at it. He even narrates the footage and adds some explanations while it's being shown in the studio, he's very skilled. It's all thanks to him helping us out that our flop moments look like they weren't actually flops (laugh). By the way, the only time we had a set conclusion in mind for a location shoot was the VTR on the hardships of left-handed people; we try to leave elements of uncertainty and unease in everything else otherwise. The only thing we work hard on is the material itself, but the location shoots are seriously a breeze since we leave everything to him (laugh). In terms of my personal ambition in the future, I would like to see Ninomiya-san come apart at the seams (laugh). Whether it's seeing him panicked or scared or touched, I would love to draw out that side of him since he's the sort of person who doesn't have a lot of emotional ups and downs. Other than that, I'd like to help him fulfill at least one of his own personal ambitions. I'm envious of the other members' segments at times because they have guests in them, but perhaps it's best for Ninomiya-san to go and do intimate location shoots on his own in the countryside after all. Haha. Neen~ he really does good with convincing the people he deals with. I love the katana episode, it was loads of fun and i honestly think no one would let him do the watermelon slicing with a sword that is being sold for a huge amount.